It’s a great word, isn’t it, murmuration? Whoever invented it to describe a huge gathering of starlings needs a special medal for eccentrically but lovingly mauling the English language. No one really knows why starlings do this. Some say it is for protection, others to indicate a roost is nearby. Or maybe it’s just because they can. 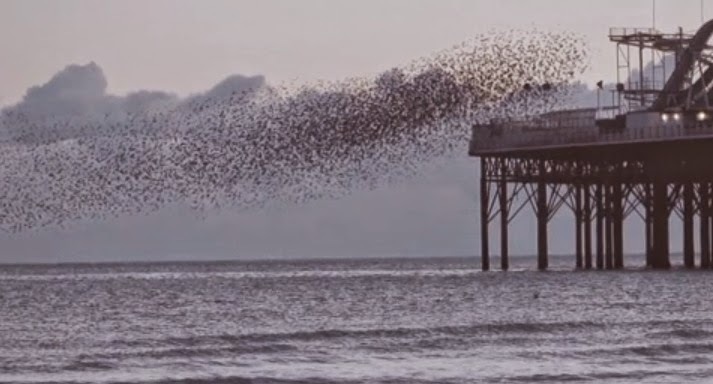 This staggering murmuration was captured in Brighton (UK) by the film making partnership of Sim Warren and Mia Xerri, The Contrast Collective.